On behalf of the board of directors of Wasion Holdings Limited (the “Group”), I am pleased to present the operating results of the Group for the financial year ended 31 December 2017. China accelerated its pace of economic restructuring amidst the global economic recovery in 2017. Given the favourable market condition, the Group adhered to the operating guideline of “seeking progress in stability” to manage both opportunities and risks on a proactive and prudent manner while promoting the development of each of its business segment in a solid way. During the year, the Group recorded turnover of RMB2,928 million, representing an increase of 12% over 2016. EBITDA amounted to RMB572 million, representing an increase of 14% over 2016. 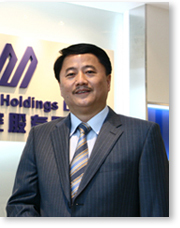 Net profit after deducting minority shareholders’ interests stood at RMB301.58 million. Earnings per share was RMB30 cents. The proportion of balance of trade and other receivables over current assets decreased to 61% at the end of 2017 from 66% at the beginning of the year. Trade receivable turnover period improved by 30 days. The board of directors proposed to pay a final dividend of HK$0.24 per share in return of the shareholders’ continuous support. Leveraging on its highly-recognized research and development strength, high quality end-customer base and marketing channels, together with cooperation with various well-known enterprise worldwide, the Group’s strategy of optimizing customer base has been proved to be fruitful, reflected by more diversified customer base. Overall, the power advanced metering infrastructure business performed well this year. The Group succeeded in bidding for contracts of over RMB660 million offered by the State Grid and the Southern Grid, outperforming its peers in both numbers and amounts. In 2017, the Group posted good results in the market served by the Southern Grid, offsetting the decrease in the tender volume from the State Grid. The communication and fluid advanced metering infrastructure business achieved satisfactory results growth throughout the year. Driven by the demand arising from “Internet+” smart energy market, the Group refined and intelligentized the management of water, electricity, gas and heating energy consumption, with its products and solutions being widely used in households and enterprises. As for the advanced distribution operations (“ADO”) business, the Group proactively commenced cooperation with customers other than the power grid companies, and successfully undertook numbers of power distribution system projects, including Changsha Metro Group and various production bases of new energy-powered batteries. The completion of the underground pipeline project in Changsha and the construction project of the information center of China Telecom in Dongjiang River, Hunan have further improved the Group’s comprehensive strength in the key ADO businesses. The Group is committed to providing products and services with high quality, high efficiency and high technologies. In June 2017, it received the Hunan Governor Quality Award (湖南省省長品質獎), the highest honor in respect of quality in Hunan province. Following the National Intelligent Manufacturing Experimental and Demonstration Enterprise (國家 智能製造重點專項及試點示範企業) granted by the MIIT in 2016, the Group was also included on the list of “National Green Factory” (國家級綠色工廠) by the MIIT in November 2017. In the future, we will continue to focus on technological innovation, maintaining its leading position in technologies and product upgrade in the industry. In the market served by the State Gird and the Southern Grid, the Group will introduce new smart meters to cater for rising market demands in addition to satisfying needs of expansion and replacement. In non-power market and new energy market, smart meters in line with the new specification required by the internet of energy will be launched. In gateway meter market, the Group will further diversify its product mix while facilitating traditional market shares. In communication and fluid advanced metering infrastructure segment, the Group will keep pace with the development of communication and water metering industry in China. While focusing on the quality of its pilot projects in Hunan province, the Group will explore comprehensive solutions to the smart water business in other key provinces and cities throughout the country, and be proactively engaged in the water project tenders organized in different provinces and dedicated to improving its after-sales service. With various proprietary intellectual properties in communication technologies including power line carrier and low frequency wireless telecommunication, diversified products applying GPRS, 4G, and NB-IoT and strong competence in network-building and solutions, the Group is well positioned to improve its industrial chain, promote the communication experience in the emerging strategic areas such as internet-of-things and internet-of-energy in order to satisfy various market requirements due to regional and environmental disparity and improve its comprehensive technological strength and competitive edge in the market. In terms of the ADO business, the establishment of advanced distribution network has been one of the priorities in the power sector development in China in the future. Demand for facility upgrade as a result of the primary and secondary power equipment integration technology presents significant opportunities for the power grid market. As a new model of business, comprehensive service, such as solutions and engineering procurement construction, will be the Group’s priority for development. With higher proportion of electricity in the end market of energy consumption and wider application of new energy, stored energy and electric vehicles, the Group will launch new products, approaches and services to meet customer’s rising demand for being smart and energy-saving in the market of comprehensive energy service and smart operation and maintenance by identifying new technologies, line of products, new market opportunities, new model of business and new source of revenue for its advanced distribution solutions. Meanwhile, with the implementation of “One Belt, One Road” initiative in China, it has been a tendency for energy connect worldwidely. The development of the power advanced metering infrastructure and the construction of power grid in the prepherial countries is expected to usher in a wider space. The Group’s overseas business will embrace more development opportunities emerged in areas of metering solutions to electricity, water, gas and heating energy, end communication business, facilities of advanced power distribution system, construction of power distribution works, and distributed power generation. Looking forward, under the operating principle of “march forward through innovative development” and driven by the market and customer, we will be determined to expand business scale, improve market structure, enhance product competitiveness and boost profitability by focusing on the improvement of overall operating quality to create values for the industry with its advanced technologies and leading position, and ultimately, to create values for its shareholders with solid returns.